According to the RPA Charter, ten chairpersons of the boards of the RPA territorial organizations have submitted reports to the RPA Executive Body. 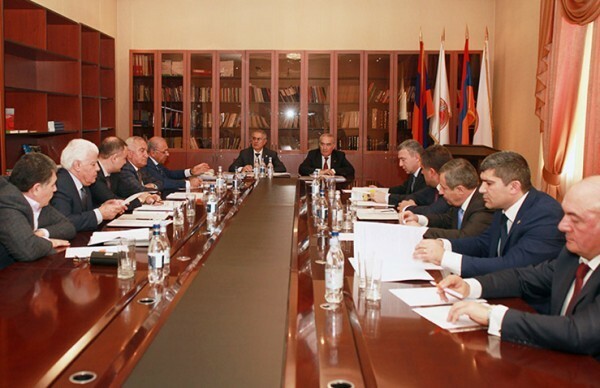 Chairman of the RPA Council of Elders Galust Sahakyan, member of the RPA Executive Body, Chairman of the RPA Organizing Committee Ruben Tadevosyan were present at the session. The speakers made reports on the works carried out during the reporting period (March 2017 to date), focusing on the recruitment of new members, National Assembly and local self-government elections, organization of various events and other issues. During the consultation, the work with each member of the party and the active public activity were highlighted. The existing problems and proposals for their solution were underlined. At the end of the meeting, the participants of the meeting also discussed the upcoming work plans in 2018.